Join us for a day of fun! Learn how to use three different Creative Grids® rulers which are featured in several Cut Loose Press patterns. Kits will be available if you want to turn that block into a project. These projects are fast fun and easy – when you have the right tools! We will learn how to make all three blocks. By the end of the day, you will have ideas for everyone on your list. The Cut Loose Press Magic Triangle pattern uses the Creative Grids 10° triangle to cut the wedges– which are curved when pieced and then trimmed with the 12½” 60° triangle ruler. Everyone will complete a “wedge” in class. We will take these wedges and show four different layouts! There is also a smaller version – Candle Mats. 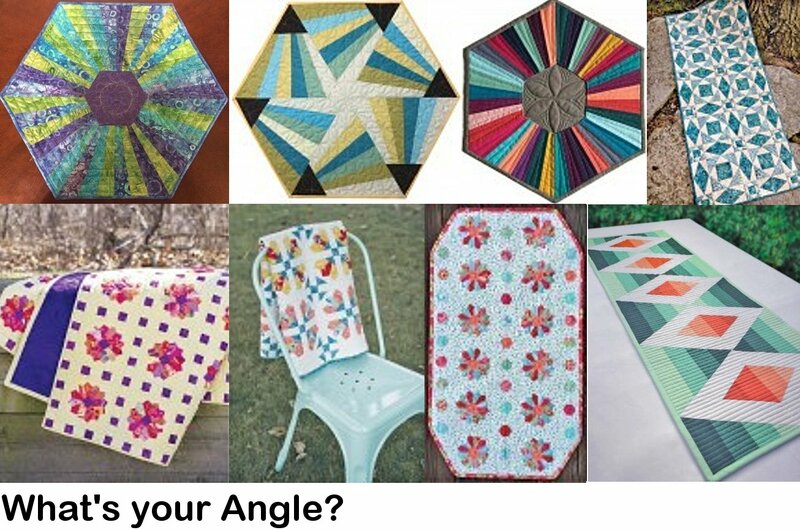 One charm pack is enough to cut the wedges for THREE mats – a great and affordable gift! The Cut Loose Press Dresden Jellies pattern uses the Creative Grids 30 degree triangle to cut the petals. Ninety-six blocks make a twin sized quilt from just ONE jelly roll! Everyone will complete one pointed Dresden plate in class! The Dresden Shooflies pattern shows a split Dresden that creates a secondary shoofly pattern. Dresdsen Hexies shows how just changing the center from a traditional circle to a hexie makes it look more modern – and totally different. Note: In class, we will also learn how to make a Dresden with rounded Dresdens using the CGRKA6 or the CGRTKAL45. The Crazy Christmas Tree is a version of a stack and whack technique that also uses the CGRKA6. We covered the Crazy Christmas Tree in a previous class here at Birdsong so we won't be going in depth on this one, but if you would like the pattern and basic information, we can give it to you. The Cut Loose Press Storm on the Lake pattern uses the six-inch Creative Grids Square on Square tool to create two different sizes of square on square blocks. These, combined with the paper-pieced diamond units, create the pattern. We will create all three units in class. Requirements: Bring a sewing machine with a ?? foot and neutral thread; a rotary cutter and basic sewing supplies. Since you will only be sewing short seams, sharing a machine with a friend is not a problem. Mats, rulers, pencils and fabric kits are provided at the demo stations. You may bring a small mat and iron to use at your machine.